Hope you're having a good weekend! I have a quick CAS card to share today - I don't think you can ever go wrong with a Black/White/Red combination. I stamped the sentiment in Black on the White base card, added the Black panel. On the top edge of the Red panel I punched using the Spiral Punch and folded the edge over. The Poppy was stamped in Black on Red and Green card stocks then cut out and placed on dimensionals on the base panel. This is stunning Lisa!! Just love your color combo and your layout!! 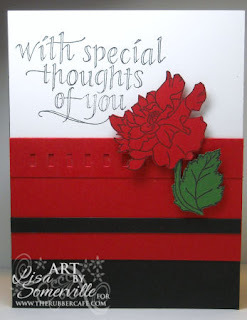 A gorgeous Thinking of you card. Have a great weekend!! Very pretty! Love the layout! Just beautiful! The colors, the layout, and you! Beautiful Lisa. Very elegant color combo. This is gorgeous! I love red, black and white cards.